(Left) C56 type Steam Loco was a small engine developed for light traffic lines. Some were exported to Thailand during World War II. Photo at Hitachi-Aoyagi in Mar, 1985. (right) C58 was developed for semi-mainline. Photo at Hitachi-Ota/Tamagawa-mura in Feb, 1998. (Left) C57 type steam Loco equipped with Moji-type deflector. Photo in Feb, 2010 at Chiba-Minato. (right) C57 is sometimes called "elegant lady" due to its slim shape. Photo at Yamato/Kitakata in Oct, 2000. (right) Steam Loco D51 498 hauled a chartered coach "Yasuragi" on its farewell run. Filmed in Mar, 2001. (left) C62 type steam loco is the largest and most powerful passenger steam loco in Japan. Photo at Umekoji steam locomotive museum in Oct, 1992. (Left) C11 type steam tank loco was deployed for local service train. Photo at Shin-Kanaya in Aug, 1989. (right) C12 type steam tank loco was for light traffic lines. Photo at Motegi in Jul, 1994. (right) Diesel Loco DD51 in JNR livery hauled a freight train on Akagawa bridge over Yodo river. Filmed in Jun, 2010. (Left) EF58 61 is the special loco designed for imperial train. Photo at Ebisu in May, 1988. 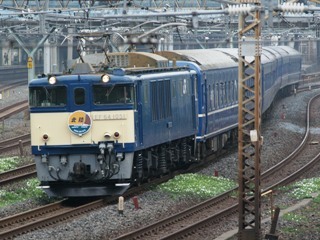 (right) EF58 122 in blue livery on special train with side-open car. Photo at Toyohashi in Apr, 1990. 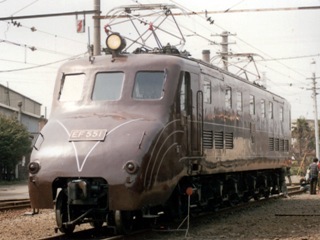 (Left) EF55 1 with steamline shape body. Photo at Takasaki in Apr, 1987. (right) EF30 is dedicated for Kan-Mon Tunnel between Shimonoseki and Moji. Stainless steel body for use of undersea tunnel. Photo at Takasaki in Apr, 1987. (Left) ED62 is dedicated for freight trains in Iida line. It has intermediate axle to reduce each axle load. Photo at Tatsuno in Apr, 1990. 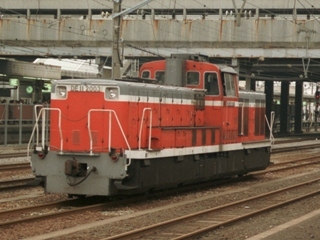 (right) EF61 200type is converted from EF60 for use of bank engine (or helper engine) at Seno/Hachihommatsu sector. Photo in Apr, 1990. (Left) EF62 hauled ski train. 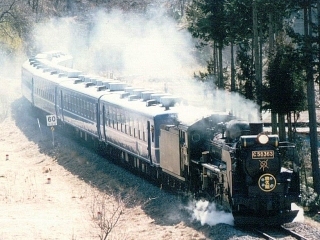 Highlander loco with dynamic brake equipment and possible to go through Yokokawa-Karuizawa sector. Photo at Kurohime in Jan, 1997. 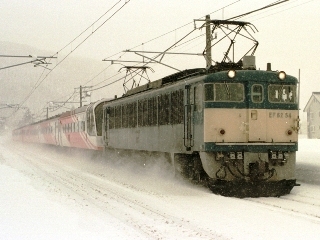 (right) EF63 was purely dedicated for the use of bank engine (or helper engine) at Yokokawa/Karuizawa sector. Photo in May, 1997. (Left) EF64 is a highlander loco, based on EF62 but aimed for multi-purpose. Photo at Yamashi-shi in Apr, 2000. (right) EF64 1000 series is dedicated for the Joetsu Line. Longer length and different side view compared from normal EF64. Photo in Jun, 2009 at Nippori/Uguisudani. (Left) EF65 500 series in limited express livery. Photo at Shin-Tsurumi depot in May, 1988. (right) Ef65 1000 series has front door. Hauling the Limited sleeper express the "Elm". Photo at Ueno in Aug, 1989. (Left) EF66, the most powerful narrow gauge locomotive. 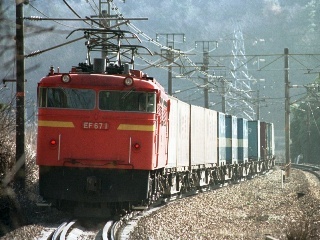 Widely used for "Blue Train" and freight trains. Photo at Chigasaki in Apr, 1988. 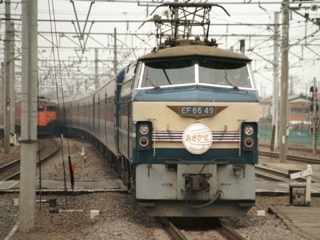 (right) EF67 is dedicated for use of bank engine (or helper engine) at Seno/Hachihommatsu sector. Photo at Seno/Hachihommatsu in Mar, 2000. (Left) EF81 is AC/DC convertible electric loco. Silver stripe on EF8181 was the proof of the imperial engine. Photo at Mito in Jan, 1989. 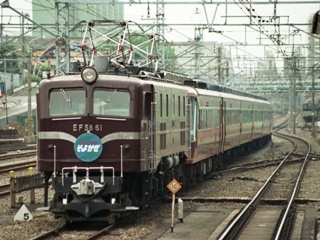 (right) EF81 300 series has stainless steel body for use of Kanmon underasea tunnel. Photo at Hatabu in Apr 1990. 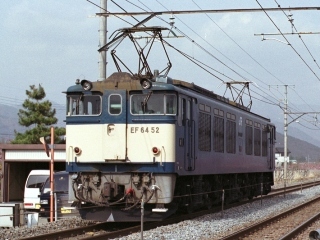 (Left) ED71 was powered with AC 20kv and used in Tohoku region. Photo at Fukushima depot in Aug, 1989. (right) Double ED75 locomotives hauled a local train. Photo at Noheji/Chibiki in Jul 1993. (Left) ED76 hauled the limited sleeper express the "Mizuho". This is AC loco in Kyushu region. Photo at Hakata in Mar, 1989. (right) ED78 is dedicated for Itaya pass on Ouu main line. Photo at Fukushima in Aug 1989. 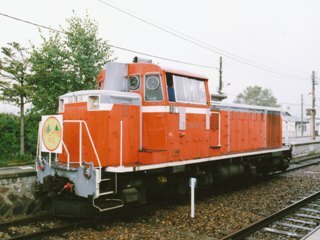 (Left) DE10 is a shunter and used for short distance train. Photo at Toyohashi in Mar, 1994. (right) DE11 is based on DE10 but omitted passenger train equipment and dedicated for freight train. Photo at Chigasaki in Apr 1990. (Left) DD51 is a powerful diesel loco used for long distance train. Photo at Izumo-shi in Mar, 1992. (right) DD51745 equipped additional light for more visibility. Photo at Kakizaki/Yoneyama in Jan 2001. (Left) Snowfighting loco DE15 with Snowplow heads. Photo at Fukagawa in Mar, 1994. (right) DD16 is a diesel loco used for light traffic lines. Photo at Nobeyama in Sep, 2000.